Pregnancy is a very blissful moment that every married women awaits. It is like a sign of angel incoming to your life. A feeling of new-life growing inside you; and the will to care it is really magical and auspicious. However, this blissful moment even demands proper care and knowledge about do’s and don’ts. There are many women who are unaware of these things and this leads to common mistakes. Here we will be describing 5 Common mistakes Woman make during Pregnancy. Every expecting mother wants to have a normal as well as a healthy baby. For this, you need to get aware of certain facts and things which your developing baby needs. Many time due to such small mistakes, baby’s health is hampered and mother also have to face many problems. So why to invite problems in you beautiful life? Let your baby enter this world happily and without any discomforts. Have a look to our following article which will describe ‘Common mistakes during Pregnancy’. This is the widely seen misconception among women, especially of rural areas. As a woman gets pregnant, relatives and family members advises to increase diet; somehow to the double. Yes, now you are two! But it does not means that simply you have to double your food intake. As a fact, a normal female requires 1800 to 20000 calories per day. Do you think such a small foetus will require such a huge amount of calories! You simply need to follow the guidance of the gynaecologist. Diet during pregnancy should be healthy and well even. As per the recent studies, during the first trimester of pregnancy you need not to add extra calories. Just eat healthy and fresh food. As you step to the second or third trimester, include 200-300 extra calories in your diet. Now the developing foetus is quite grown and also requires extra calories. During Pregnancy, a woman needs extra rest and a surrounding free from stress. Extra rest doesn’t means, sticking to the bed all the time. During Pregnancy, your body undergoes certain physical and hormonal changes which of-course requires proper rest. A pregnant woman requires 7-8 hours of sound sleep at night and it should be calculated 9-10 hours at whole. Sound sleep and a free mind are the basic necessities for a healthy and pain-free pregnancy.Sleep is very important during pregnancy, you must have proper and sound sleep to give your body and vital organs some rest. Make sure you have a proper and comfortable sleep. A lot of women from the older generation still believe that a pregnant woman should keep her physical activities to as little as possible. This is however, not true for every expecting mother. Mild to moderate activities can be good for you and your baby’s health. Yoga and several Pranayama are very well suggested for the well-being of the child growing inside. You can even opt for walking and other physical activities for a healthy pregnancy. It helps to avoid the discomforts during pregnancy and also increases the chances of normal delivery and a healthy baby. Normal delivery means labor pains which is very scary for a woman. But choosing a C-section thinking it is an easier method is the most common mistake every pregnant woman makes. 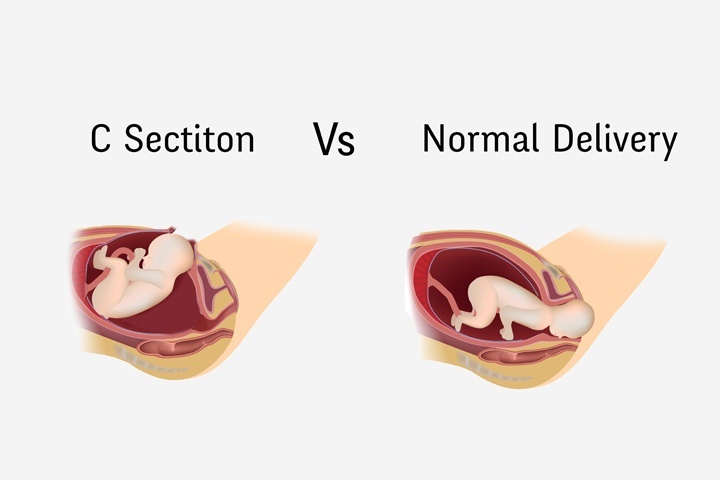 C-section looks easier way to get rid of labor pains, but in reality it is more painful in the long run. A Caesarean Delivery means a longer period of recovery, difficulty in feeding the baby and pain in the lower back (due to the injection given in the lower back). C-Section delivery can be very painful and not a right choice. Mood swings are very common during pregnancy. Irritation, sudden anger etc situations and often faced by a pregnant woman. For a safe and healthy pregnancy, you need to control and abide these problems. There are many woman, for whom getting stressed is the favourite task. In such cases, there are the less chances of normal delivery! Remember, Pregnancy is the period when your emotions too are attached by the developing foetus. Try to stay stress free in any manner you can. Go with the comfortable clothes; you need not to hang lots of clothes such as saree on you. Go with the clothes which makes you feel comfortable and happy. Pregnancy is the very beautiful moment, don’t spoil it with such mistakes. Try to stay happy always. Have a happy and beautiful pregnancy. Take care and live well!